Although our children have been out of diapers for about two years now, we still have quite a collection of diaper wipes bins. Each time we bought a case of wipes from BJ's Wholesale Club, one more empty bin was added to our collection. I have always used them to hold small toys, but have recently discovered a new way to repurpose them. 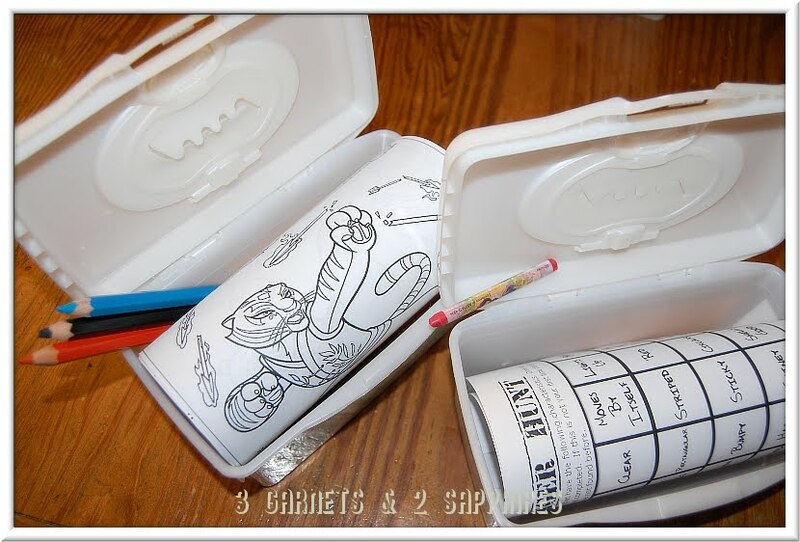 I got the idea of making pre-assembled boredom kits from Savannah of the Garnish blog. Since this is a school vacation week, it was the perfect time for me to test this project out. It only took one day for our children to come to me to tell me they were bored. I had made 6 kits altogether and will refill each one with something new after it has been used. Below you will find labels that are sized to fit on the ends of Huggies Wipes bins. All I did was print and cut out the labels. Then I glued them on with a little Modge Podge and added another thin layer of Modge Podge on top to seal them. TO PRINT: Click on image below to enlarge. Then right-click on image and select print. Use your browser's back arrow to return to this page. Now comes the fun part . 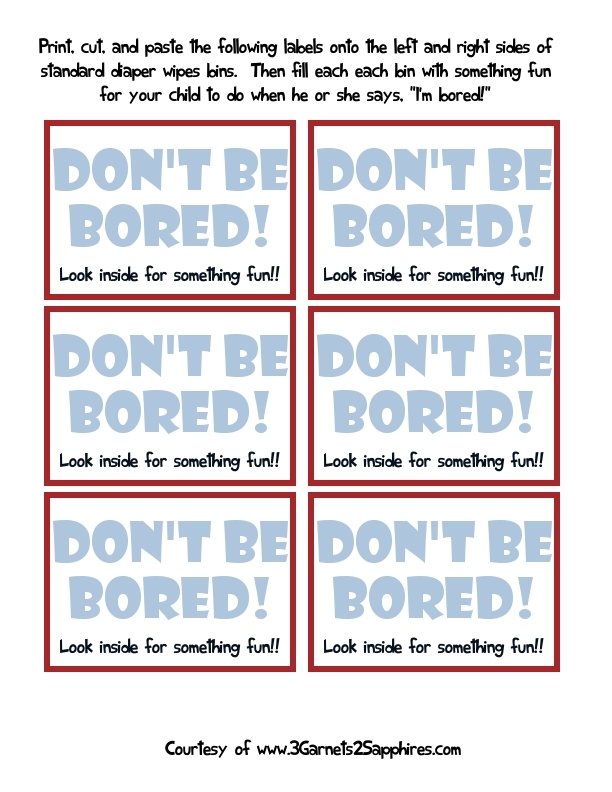 . . filling your "Boredom Kits!" I did purchase a few things from the craft store, but a lot of what I used were things I had in the house already or could print off the Internet. 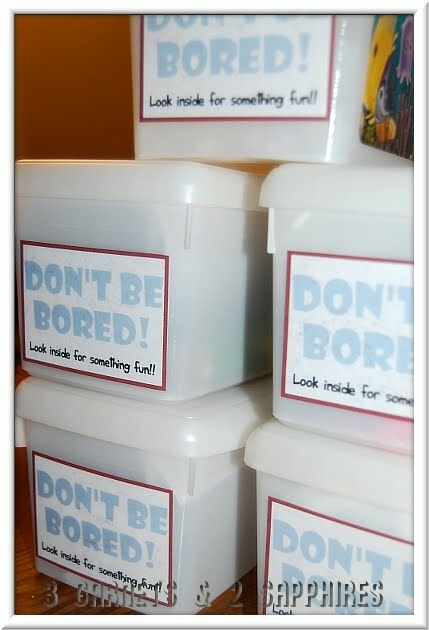 Ideas for filling your "Boredom Kits" . . . There was one glitch that was unforeseen by me. An 8.5" x 11" piece of paper is just slightly too wide to roll and fit inside the bins. I had to trim them to make them fit. When my children came to me and announced that they were bored, I instructed them to choose one bin. They could not look inside the bins before choosing and they had to agree to do whatever activity was inside. 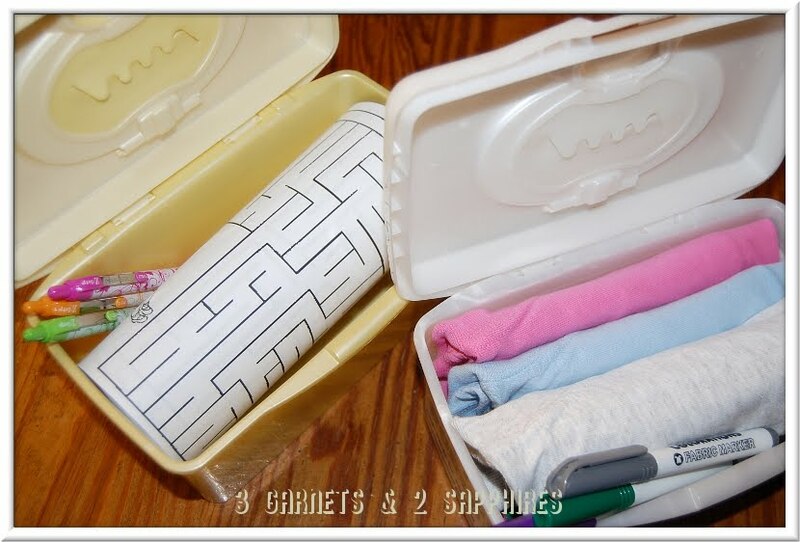 The first Boredom Kit my children chose contained age-appropriate word searches and mazes. All three of our children, ages 8, 5, and 5 actually enjoyed doing these puzzles even though some of them were a little challenging for them. 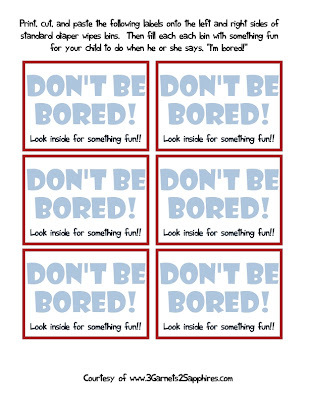 If you have other ideas for filling our Boredom Kits, I would love to hear them. I intend to have these filled and ready-to-go for all those snowy, rainy, and lazy summer days ahead.